France is not the first place I think of for traditional, keep it true, heavy metal. Overrated wine, impossible to make food, and dance music, yeah. But heavy power metal. Not so much. Then there's Lonewolf. They've been galloping about their native land and most of Europe for better than 25 years. 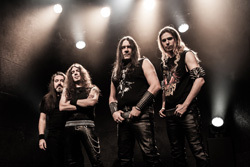 They release their eighth studio album with The Heathen Dawn, still with Massacre Records. And not much has changed. Nothing really. The Lonewolf formula remains the same: riffs upon power chord riffs which create twin guitar harmony are pushed along with the galloping speed of a forceful rhythm section, and then accented by flaming guitar solos. Toss in Jens Borner's raspy, yet melodic, vocals and the rest of the band adding some gang vocals, and you have as sufficient summary of their sound. Many songs have a familiar start, Michael Hellstrom firing off some quick and slick leads as with Heathen Dawn and Song For The Fallen. And the pace rarely slows, though it does moderate on a few songs like When The Angels Fall or Until The End. But amidst the racing speed of the other songs, you'll barely notice. So that's pretty much it. Lonewolf remains one of the finest purveyors of true heavy/power metal in the best tradition, and The Heathen Dawn is another solid accomplishment. Up the irons and hail metal! 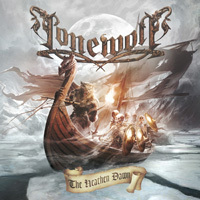 Lonewolf remains one of the finest purveyors of true heavy/power metal in the best tradition, and The Heathen Dawn is another solid accomplishment. Up the irons and hail metal!